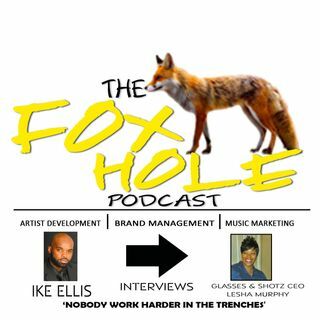 The Fox Hole had the opportunity to interview the CEO of Glasses and SHotz as she prepares for the all white affair may 9th in wilmington north carolina. Listen in to the conversartion as she answers questions about entreprenuership, music consumer purchases and more.... Listen to her questions from these questions below!! Who do I pleasure of speaking with today? What is your expertise; inform us about your company? What were your first steps to starting your own business? How do you feel your company contribute to the music industry? As an entrepreneur, how important is brand management? What ways do you market your company to the people? How do you find companies to contract your services? Have you had any other business? If so, what were the results or outcome of the company? When do you think people should invest in their own company versus working for another company? As a consumer, what makes you purchase a song? Where do you go to find your latest music? I heard you have landed a situation with a special event coming may 9th. Tell us about it! Is there anything else you would like to promote to the people? Im going to say two words and you have to choose the one words without any hesitation.